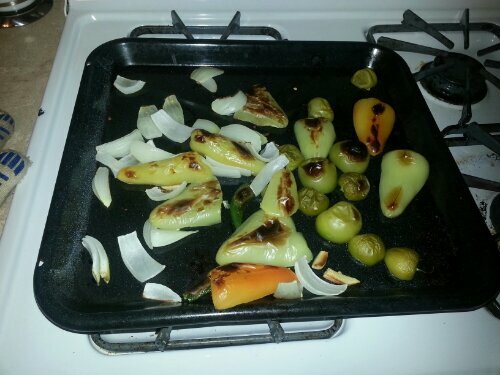 This week I was given some tomatillos and some peppers. Seemed like the perfect time to make salsa verde. 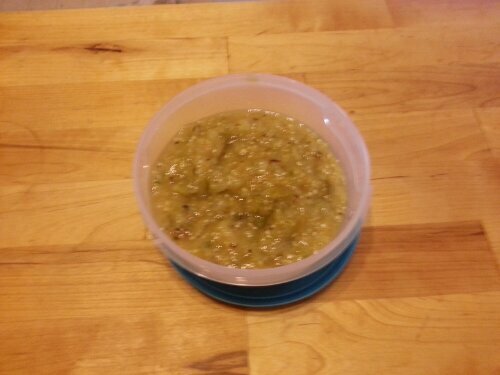 After removing the husks and and washing the tomatillos. I cut them in half. I split and seeded the peppers. Cut up some onions and garlic. Put them all under my broiler for about 15 minutes. Till they looked like this. After they cooled I put them all in the food processor with the juice of one lime salt and cilantro to taste and ran it all around. The finished product looks like this. It’s fresh and delicious awesome on tacos or just chips and so easy to make. There seems to be an over abundance of cucumbers in my area. Friends are gifting garden cukes and there are some in my CSA. So I wanted to pass along a quick cucumber recipe. I don’t much feel like making pickle right now, but this is easy and delicious. Slice the cucumbers thin I don’t peel them. You can if you want to I think they hold up better not peeled. Mix all the other ingredients in a very large bowl and toss the cucumbers to coat. If you can make it the day before and let it sit in the refrigerator overnight. That’s it so simple and so very good. I could eat this all the time.